Bottega Veneta Fall 2009 Ready to Wear Collection: Bringing the Drama : Steal This Dress! If you are searching for an outfit that screams DRAMA, look no further than the Bottega Veneta Fall 2009 Ready to Wear collection. You can definitely still do strapless bustier-style dresses in the fall. All you have to do is throw an elegant pea coat over it. As far as the “no white after Labor Day” rule–it primarily applies to shoes. 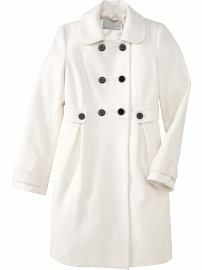 However, people often get shy about wearing white garments during the colder seasons. But this need not be the case. Just stick with whites when selecting your coat. The result will be a dazzling, winter wonderland-esque ensemble. Now, on to the accessories. A ruffled purse gives this otherwise sleek, clean look a punch of texture. 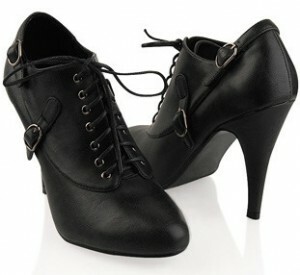 The lace-up ankle booties (and just a bit of sock peeking over the top) add a touch of vintage femininity. 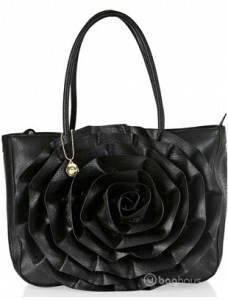 The black, on the other hand, provides the look with edge. Overall, this Bottega Veneta combination is a brilliant mix of several aesthetics. Take this already unstoppable look to the next level with strong red lips and a vintage-inspired hairdo. Vavavoom!